There has been a flurry of activity just prior to the opening of the annual winter meetings. Robinson Cano has agreed to a ten-year, $240M contract with the Seattle Mariners. Clearly, the Mariners have lost their minds. But the Yankees have lost a second baseman. And Daniel Murphy can rest easy, knowing that Cano won’t be taking his job in 2014. The Mets bid against themselves and gave Curtis Granderson the fourth year he was seeking. According to reports, the Mets and The Grandy Man have agreed to four years, $64M. We’ll cover this in more depth soon enough, but I’m at work so can’t offer my two cents at the moment. Meantime, though, post your reaction in the comments. 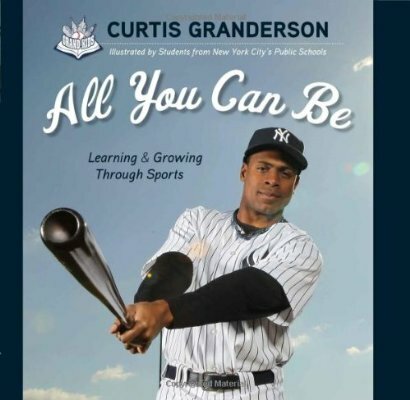 There is also a drawing book featuring Grandy that was written during his time in Detroit: All You Can Be: Dream It, Draw It, Become It! Scratch Rafael Furcal off the list of possible shortstops for the Mets — he signed a one-year, guaranteed deal with the rival Miami Marlins; terms are believed to be $3M plus incentives. We weighed in on Furcal a month ago when there was first buzz about the Mets kicking the tires on him. I didn’t think it made sense for the Mets to sign him as their “answer” at shortstop. Rather, I thought it would be a decent gamble, provided he wasn’t the ONLY upgrade at the position. As it turns out, the Marlins envision him as their second baseman. So there you go. Your reaction? Sound off in the comments. With the Mets lagging behind the competition in every department except High-End Starting Pitching Prospects, there’s a pressing need for either creativity or dollars to make up that gap. Seeing as how the dollars don’t appear to be flowing, let’s get creative! 2012-2013 Oakland A’s, plus at least one or two key Rays players every year. One area in which the Mets have particularly struggled during the Alderson regime is relief pitching. While the Rays were getting stellar seasons out of journeymen, minor leaguers, and failed starters, the Mets were selling low on Angel Pagan to buy high on Ramon Ramirez, winning the Frank Francisco bidding, and making desperation promotions like Robert Carson. If the Mets want to catch up to the opposition, their bullpen track record has to change. Fortunately, there’s a way to do it that not everyone has caught onto yet: find failed starting pitchers who throw strikes. after switching to relief, but their ability to prevent baserunners more than made up for it. If this seems counter-intuitive, in an era where throwing 97 with no control seems to make a pitcher a coveted reliever, then good. If no one else sees it, the team that does can gain an advantage. While other teams are trying to grow the next Billy Wagner, the Mets can grow the next Doug Jones. Laugh at your memory of slop-tossing Doug… and then look up his stats. Of retired pitchers with more than 1000 innings pitched, the all-time K/BB list reads Curt Schilling, Pedro Martinez, Mariano Rivera, Trevor Hoffman, Doug Jones. 303 saves isn’t too shabby either. Coming off Tommy John surgery, Baker threw only 45 innings last year and was pretty terrible. His career 2.1 BB/9 rate is good, but not at Eck or Uehara levels. On the plus side, he’s a free agent, should be cheap, and may be desperate enough to keep his career going that he won’t contest a move to relief. best pitch before 2009, hasn’t been effective in years, and his 4-seamer’s been lit up like crazy. So he’s a bit of a project. If he has a future as a precision 2-pitch short reliever, it’s probably with his sinker and curve. The Indians still control Tomlin, who’s arbitration-eligible for the first time in 2014. After 2012 Tommy John surgery, who knows what the Indians think of him, but his performance before the surgery was exactly the sort of thing that got Eck and Uehara sent to the bullpen: way too many HRs. So I’m guessing he’ll be cheap. Why am I interested in a guy who’s allowed 1.4 HRs per game in his career? Well, it’s simple: of all the pitchers I looked at, Tomlin’s control is the best, with a 1.7 BB/9 career mark and 0 walks in his 27 minor league innings last year. His curveball, cutter and change-up have all been good at times (though never all at once), so the Mets would need to identify which one to focus on. pretty underwhelming going into 2010. Since many bullpens are cobbled together by gathering a bunch of arms and hoping one sticks, the same methods could be employed here: bring in Baker, Francis and Tomlin, hoping one of them makes it. It may not be perfect, but it may just work out better than all those other teams betting on the likes of Matt Lindstrom, Jose Veras, or Kyle Farnsworth. Usually innovative fan proposals have about as much chance of coming true as Justin Verlander learning a knuckleball, but if we want to look for signs of hope, the Mets do have a prime example right under their noses. Carlos Torres spent 2013 throwing a lot of strikes. As a starter, he gave up (surprise, surprise) too many hard hits and homers. But in relief? A 1.47 ERA, and opponents hit .203 / .232 / .316 off him. Find a few more performances like that, and the Mets could turn a weakness into a strength, all without breaking the bank. What do you think? Is this just the type of “moneyball” initiative Mets fans have been waiting for since Sandy Alderson, Paul DePodesta, and J.P. Ricciardi took over? If so, who do you see as “next-Uehara” candidates? Sound off in the comments. Have you done your holiday gift shopping? Then it’s time to start wrapping the gifts. You need the stuff that goes outside the box (see what I did there?). 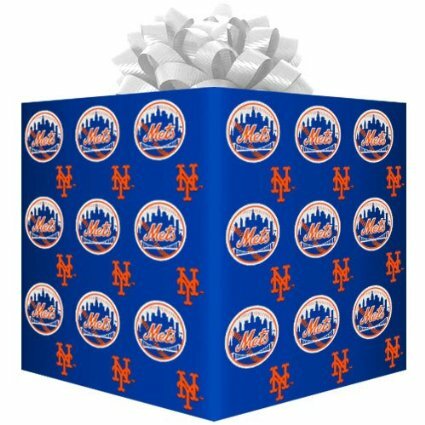 How cool would it be if the gifts were covered in New York Mets Wrapping Paper ? This thick, high-quality paper is available from Amazon for less than ten bucks, and includes 150 square feet of wrapping. Follow the link or click on the image below.